Tracie Miles helps women to understand how God uses the often painful experiences of their past to equip them for his service now and in the future. Through real-life stories - her own and others - Tracie offers women a fresh sense of their worth and purpose. About "Your Life Still Counts"
Many women carry around a deep, hidden, and unspoken sense of insignificance, regardless of how confident they appear on the outside. Regret and shame over failure, sin, and shortcomings weigh them down and make them feel unworthy to be loved, much less used, by a holy God. 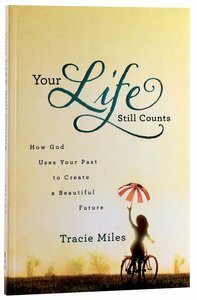 Tracie Miles helps women not only recognize that God has a purpose for them, but that He has equipped and prepared them for their divine purpose based specifically on the experiences of their past. Through her own story and stories from other women who have discovered great purpose because of adverse experiences, she helps women embrace a new perspective and discover the courage to step out of their comfort zones to help others. Readers will find forgiveness and healing for the mistakes of their past, and inspiration to step into the purpose God has for them. TRACIE MILES graduated from the University of North Carolina. She has focused on building God's kingdom through speaking and writing. Tracie has been the Women's Ministry Director for a large church for five years. She is also a writer for Proverbs 31 Ministries. She and her husband Michael have three children and live in Charlotte, North Carolina.